E. Jones’ newest thriller The Secret Blush. The past has a way of catching up to you . . .
After a messy affair ends, Jennifer is trying to rebuild her life and start a career as a New York City private investigator. But when she is caught in a shooting at her favorite coffeehouse, bitter events from the past come back to hunt her. Learn more about Puja Guha at my website www.pujaguha.com. Family drama THE CONFLUENCE is available as an ebook at and a paperback at Amazon.com. http://smarturl.it/Confluence. I’ve recently started working on the sequel to my first book, Ahriman: The Spirit of Destruction (http://amzn.to/1rJjjb0). In the first part of this as yet unnamed sequel, my main character Petra Shirazi spends a great deal of time in Paris. After returning here for the first time since moving away in 2011, I am reminded again and again of how jealous I am of her for being able to live in and spend her time in this amazing city. Lots of people have different experiences associated with Paris. Almost everyone is entranced by its beauty; every street corner is like walking through a postcard. Travelers that haven’t enjoyed it as much have a range of complaints that I won’t go into here. What the city does offer though is a wonderful appreciation of art in all its forms. 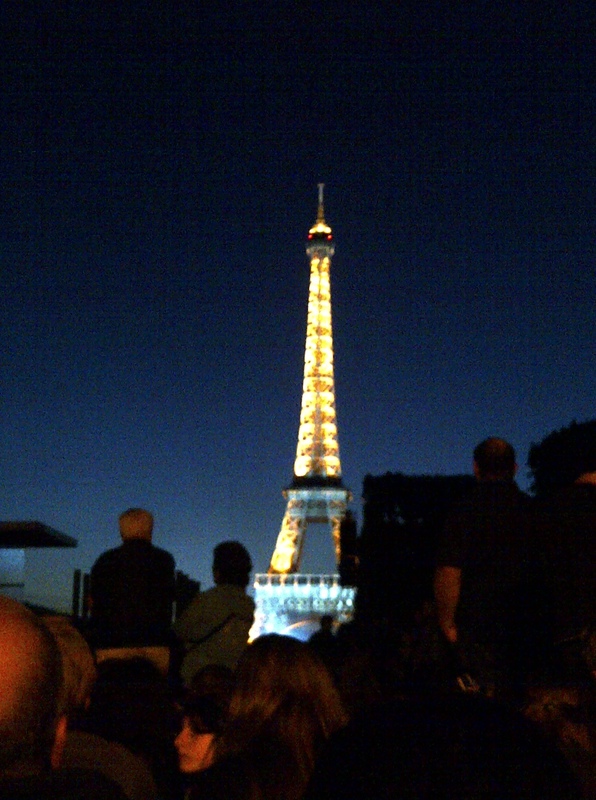 Earlier tonight, I watched the July 14th (Bastille Day) celebrations at the Eiffel Tower. I’ve seen a number of different firework shows in New York, Washington DC, Chicago, and Toronto, but without question, I can say that I have never seen anything like this. The show cannot be called anything but the finest form of art, with the fireworks choreographed to a combination of music from Mozart, Beethoven, John Lennon, and other prominent musicians. I felt like I was back on the ice rink choreographing my own figure skating routine with all of the emotion the fireworks brought to each piece of music. What’s even more amazing is that I felt this level of emotion in spite of jostling with other people in the crowd and constantly craning my neck to see. I’ve attached one picture I managed to get from before the fireworks started and will add others that I can get from friends of the later festivities, along with a youtube link eventually. To sum it up in a word though – the event was breathtaking, as is most everything in this city. Maybe I can move back here someday, but until then, I will be living vicariously through Petra. A couple of weeks ago, I published my first book, Ahriman: The Spirit of Destruction, Book 1 of The Ahriman Legacy (http://amzn.to/1rJjjb0). Since then, a number of people who I’ve met have asked me the same question: How did you know that writing was something that you wanted to do? The answer to that is simple, as my husband put it a couple of days ago. I knew it in my bones. Writing is more than a hobby to me, more than just a pastime. When the idea for Ahriman: The Spirit of Destruction struck me, I had all these plans to write the story within six months. Of course, that didn’t happen, but over time, on the days that I didn’t write, I started to grow more and more unhappy. I had all kinds of good excuses as to why I wasn’t writing. I was traveling a lot. I had more than enough coursework to fill my time in graduate school. I said things to myself like, “I can’t write tomorrow, because I have plans to spend time with BLANK.” The BLANK there can be replaced with the name of a friend, an event, or an outing in Paris or London, where I was living at the time. Or frankly just with whatever scheme for procrastination stood out at that particular moment such as an addictive television show or a new book. When it all came down to it though, I knew what I should be doing with my time. I knew that I should be writing. Developing a regular practice took some time and work. Even now, I would say that it’s a work in progress. I write every weekday a minimum of 1700 words. Sometimes that takes five hours, and sometimes it takes two. Sometimes the ideas that I’m putting down on the paper have been in my mind for days, and others they just appear as I’m writing, without rhyme or reason. No matter what though, I put in that many words, and move my stories forward. At the moment I’m working on the sequel to Ahriman: The Spirit of Destruction and hoping to have it done by the end of the summer. Then the editing and the revising will begin. My first novel AHRIMAN: THE SPIRIT OF DESTRUCTION (Book I of The Ahriman Legacy) is available as an ebook at all major retailers and a paperback at Amazon.com. http://amzn.to/1rJjjb0.